In the beginning of January, 2008, Multi-National Division - Center (MND-C) transitioned from Operation Marne Roundup to Operation Marne Thunderbolt. 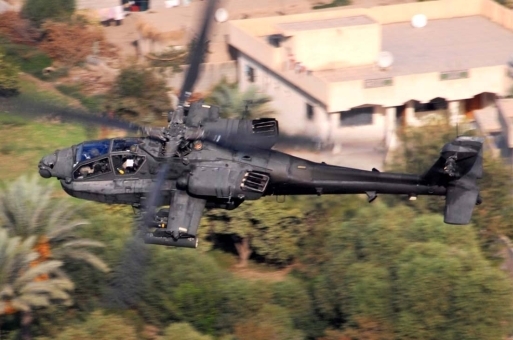 The 3rd Combat Aviation Brigade and the 2nd Brigade Combat Team of the 3rd Infantry Division have teamed up in offensive military operations in the areas southeast of Baghdad to root out elements of al-Qaeda in Iraq (AQI) from the southern area of Arab Jabour. Arab Jabour is a former insurgent stronghold that is located a only few miles southeast of Baghdad along the western bank of the Tigris river. Insurgents had used this territory in order to funnel accelerants of violence into Baghdad. The 2nd BCT of the 3rd ID was joined by the 5th Battalion of the 7th Cavalry Regiment for this operation. Previous operations have pushed the insurgents further south in Arab Jabour, away from Baghdad. Operation Marne Thunderbolt aims to keep AQI elements from slipping out of the territory by setting up blocking positions to block escape routes and then to rely on tips from Concerned Local Citizens (CLCs) to pick off the insurgents. AH-64 Apache Helicopters from 1st Battalion, 3rd Aviation Regiment, 3rd CAB are striking extremists on a regular basis during Operation Marne Thunderbolt. At the same time, troops from the 2nd BCT are working with Iraqi Security Forces and CLCs in the area to keep pressure on the enemy as patrol bases are built and security is restored. These operations relied heavily on aerial operations to help clear areas before Coalition Forces would push into an area. The first such case occured on January 10, when the Army and Air Force conducted a major joint operation in Arab Jabour. Similar operations were also carried out on January 16 and January 20. In total, 99 targets were hit and 99,000 bombs were dropped in such shaping operations. In total, Marne Thunderbolt cleared 267 IEDs. Operation Marne Thunderbolt is a part of Operation Phantom Phoenix, an overarching operation to defeat AQI and Shi'a extremist groups in the Baghdad Belts and Northern Iraq. On February 15, 2008, Task Force Marne concluded Operation Marne Thunderbolt and transitioned to Operation Marne Grand Slam, which focused on clearing insurgents from the Salman Pak area, which lies across the Tigris River from Arab Jabour.